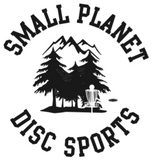 The sport of disc golf evolved as an offshoot of the many games spawned by the Frisbee® craze. The game started with people using Frisbees and aiming at targets made up of trees, trash cans, light poles, pipes, and whatever else was handy. Disc golf is similar to regular golf; however, instead of using golf clubs and balls aiming for a hole, Disc Golf players use golf discs and aim for a Disc Pole Hole, a pole extending up from the ground with chains and a basket where the disc lands. The object of the game is to complete each hole in the fewest number of throws, starting from a tee area and finishing at the Disc Pole Hole. Generally, a course is 9 or 18 Disc Pole Holes long. Players start at hole one and complete the course in order, playing through to the last hole. The player with lowest total cumulative score wins. Disc Golf differs from regular Golf in important ways. Disc golf courses can use a wide variety of terrain. Often times, land not suitable for other park activities or development is perfect terrain for a disc golf course. Disc golf is one of the best lifetime fitness sports. It is easy to learn, a healthy activity, and accessible to people of all ages and fitness levels. 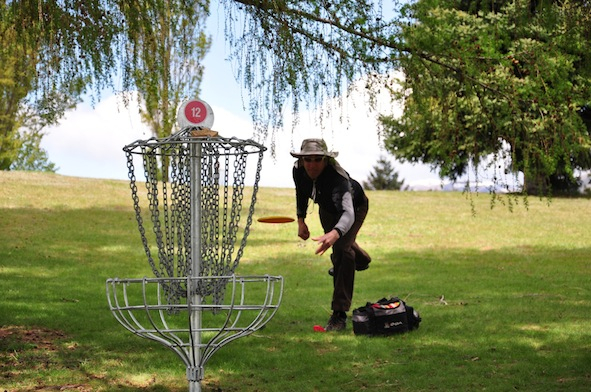 If you can throw a Frisbee® and you like to have fun, you can play disc golf. The rules are quite similar to the rules used in the game of “Club Golf”, including the matter of courtesy. It is only fair that your opponent’s turn to throw be without distraction, just as you would like it to be for yours. Do not throw your disc until you are sure its flight or landing, will not distract another player. Each hole starts with a tee-off, followed by subsequent throws until players reach the basket. Scoring is the same as ball golf. A stroke is counted each time the disc is thrown and when a penalty is imposed. Strokes are totaled to arrive at the game score. If completing in groups, the players with the fewest strokes wins. Tee off order on the first tee will be by mutual arrangement or by flipping discs. The printed side is heads and the odd man should be first. Tee off order on all subsequent holes is determined by the score on the previous hole. The player with the lowest score tees off first. Leave it better then you found it. Unfortunately, there are usually litterbugs found on every disc golf course. Hopefully, everyone else will get the idea sooner or later.